STEP 1: The total quantity of Certificates ('Solar' and 'Non-Solar' separately) placed for dealing on the Power Exchange(s) by the eligible entity shall be less than or equal to the total quantity of valid Certificates held by the eligible entity as per the records of the Central Agency. The renewable energy certificates shall be dealt in the Power Exchange within the price band as specified by CERC from time to time.The Eligible Entity shall place for dealing of renewable energy certificates, both 'Solar' and 'Non-Solar' Certificates, on any Power Exchange authorised to deal in renewable energy certificates by CERC. The total quantity of Certificates ('Solar' and 'Non-Solar' separately) placed for dealing on the Power Exchange(s) by the eligible entity shall be less than or equal to the total quantity of valid Certificates held by the eligible entity as per the records of the Central Agency. The renewable energy certificates shall be dealt in the Power Exchange within the price band as specified by CERC from time to time. STEP 2:During the time the bidding window opens in the Power Exchange, the eligible entities shall place their offers and the buyers1 shall place their bids through the trading platform of the respective Power Exchange. STEP 3:On closure of the trading window, the Power Exchange(s) shall send the maximum bid volumes for each of the eligible entity, which has placed offers on that Power Exchange, to the Central Agency for verification of the quantity of valid RECs available with the concerned eligible entity for dealing on the Power Exchange(s). STEP 4: The Central Agency shall check the combined maximum bid volume in the Power Exchange(s) for each eligible entity against the quantity of valid RECs for that entity for both 'Solar' and 'Non-Solar' Certificates. The Central Agency shall send a report to Power Exchange(s) confirming the availability of the valid RECs with the eligible entity. 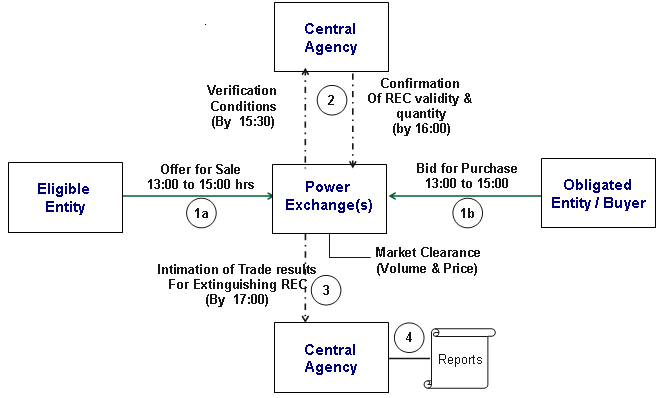 In case the combined maximum bid volume placed for dealing in the Power Exchange(s) exceeds the quantity of valid RECs held by the eligible entity as per the records of the Central Agency, then, the Central Agency shall advise the Power Exchange(s) to exclude such bid(s) while working out the Market Clearing Price and the Market Clearing Volume. STEP 5: The Power Exchange(s) shall work out the Market Clearing Price and the Market Clearing Volume taking into account the advise received from the Central Agency and send the final cleared trades to the Central Agency for extinguishing of the RECs sold in the records of the Central Agency. The certificates will be extinguished by the Central Agency in the 'First-in-First-out' order.